Propane tanks are 20 times more puncture resistant that tanks filled with ethanol, methanol or gasoline. They are constructed from carbon steel, under the procedures developed by the American Society of Mechanical Engineers. Propane cylinders are equipped with a device that cuts off the filling process, when the tank reached 80 percent of its liquid capacity. This helps pressure inside the tank, caused by temperature to variate, without a gas emitting from the tank. Unlike other fuels, like gasoline, propane can not be ingested, due to the fact that it is vaporized internally when released form it’s container. Leaks do not form a puddle; propane dissipates into the air. In contrast with gasoline’s ignition temperature of 430 to 500 degrees F, propane will not ignite until the air reaches at least 940 degrees F.
Modifications or alterations to your propane system should be handled by authorized personnel only. Tampering with the system may cause a potentially dangerous situation. The easiest way to detect propane is by it’s very unpleasant odor. If the scent of propane is in the air, a potentially dangerous situation may exist. Extinguish all open flames, and immediately leave any area where propane fumes are present. In case of a leak, go to your propane system’s storage vessel, open the tank hood, and close the vapor service valve. Then, contact a qualified technician for assistance. Electronic leak detectors are available. Contact your nearest propane retailer for the purchase of a detector. Propane is heavier than air. The vapor will descend to the lowest point, for example, your basement. Avoid these areas when a leak is suspected. Never tamper with your system’s supply lines. Never tamper with and safety devices, regulators, or storage tank fittings. Never use an open flame, to test for propane leaks. Please have your propane system checked if you have any of the following systems of carbon monoxide poisoning: headaches, dizziness, loss of muscular control, vomiting, and watering of the eyes. Prevention of carbon monoxide poisoning is listed in the following steps: Never use range burners as space heaters. Never use propane heaters that are not intended for indoor use. Never use a barbecue grill indoors. Have all propane appliances tested regularly by a qualified technician. Always make sure there is plenty of ventilation. Carbon monoxide detectors are available at most hardware stores. 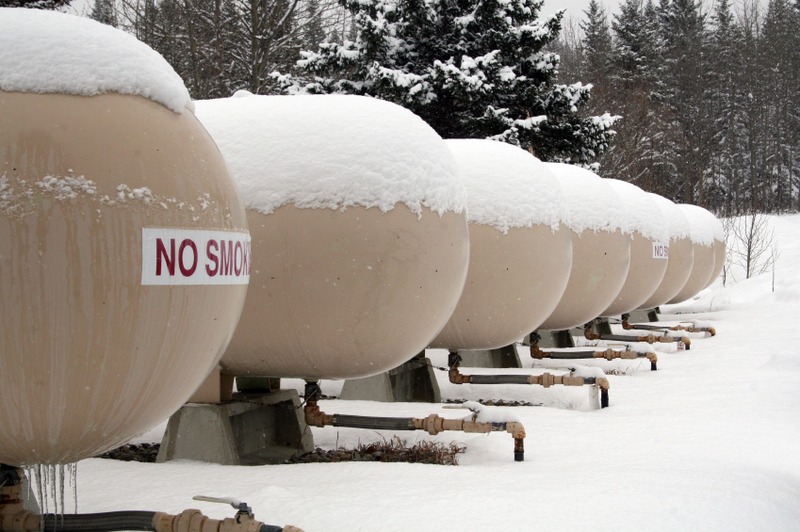 Propane leaks smell like rotten eggs. Educate your family so they may recognized the smell. If you smell a leak, evacuate the premises, and contact your local fire department, or propane supplier. When leaving the premises, do not alter any electrical outlets or light switches. Propane leak detectors are available at your local hardware stores. Know the layout of your gas services lines, especially if you are doing any type of landscaping or renovations. If you suspect your gas appliance has been damaged by water or flooding, have a trained technician come out and service your system. All furnaces should be cleaned regularly. Check with your propane retailer, and owners manual for cleaning instructions. Have your range serviced if the flames are not blue. Yellow flames indicate blockage to the air inlets, or an adjustment may be need to the burner. Contact a technician to service. Also, do not line your range with tin foil; it constricts air circulation. Never contain grill in an enclosed space. Always use grills outdoors, in a well ventilated area. Do not place grill near leaves, brush, or your home. Always keep the cylinders in an upright position. Never store spare gas containers under or near the grill. Always follow the owner’s manual, and keep it in a place that is easily accessible. Close the cylinder valve when it is not in use. Also, make sure all grill controls are in the off position. Never attach or disconnect a cylinder, or alter the cylinder fittings when the grill is in operation or if it is still hot. Do not cover your grill until all controls are turned off, and the grill has completely cooled down. Have all cylinders checked for dents, rust or leaks, when you are having it refilled. Never leave a filled cylinder enclosed in a vehicle. Keep your car well ventilated when transporting cylinders. Cover disconnected hose-end fittings and burner air intakes with protective fitting caps, when your grill is not in use. These caps keep dirt, moisture and insects out of your equipment. Use a pipe cleaner or wire to clear blockage in tubes that lead to the burner. Check grill hoses for deterioration and kinks in the tubing. Leak-detection solution can be purchased at your local propane gas supplier. Check for leaks, before igniting a grill burner. Also, check connections for tightness. Never use matches or lighters to check for leaks. Immediately turn off the gas and do not ignite, if you detect the pungent smell of propane gas. In case of an uncontrollable fire, call your local fire department immediately. Please refrain from smoking while handling your propane cylinder. Never allow children to tamper or play with your gas grill. Do not store where cylinder would be exposed to high temperature. Move gas hoses far away from possible dripping hot grease. Check your owners manual if you have problems getting your grill to work. If you can not troubleshoot the problem, it is best to contact your local propane retailer. Call a certified technician if the burner flame is not blue. Yellow flames indicate that air inlets are obstructed or burners need to be adjusted. Keep pot handles turned inward, to avoid accidental spills, and to keep out of the reach of small children. Keep the grill and range surface clean and free of corrosion. Never cover the bottom with foil. The foil will restrict air circulation. Never use your grill as a space heater. Keep flammable material away from grill or burners. 40,000 BTU rating: The cylinder should fuel this appliance on a high setting for over 10 hours of continuous use. 60,000 BTU rating: The cylinder should fuel this appliance on a high setting for over seven hours of continuous use. Most cooking is done by starting on high and preheating the grill, and then turning the burner to medium or low for cooking, which will affect usage time. Properly secure the propane tank, if possible. Never bring a propane tank indoors. Turn off the gas supply valve at the tank. Fasten the protective dome on the tank. Turn off appliance pilot lights, control valves and manual shutoff valves. Ensure an adequate supply of fuel is in the tank. Visible structural tank damage; including external appliance venting and vent caps. 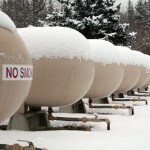 Propane tanks that have shifted or moved. Broken, bent or otherwise damaged gas lines. Appliance controls or appliances that have been exposed to water. Tank regulators that have been exposed to water. Never attempt to make repairs yourself or to use appliances or equipment if any of these conditions exist. Have any appliances or equipment damaged or exposed to water inspected by a licensed gas supplier or technician prior to use. Do not use any type of equipment fueled by gasoline, propane or other fuel indoors as they may produce hazardous carbon monoxide. If you did not turn off the gas tank prior to evacuation, do so before turning on any electrical service or attempting to use any device that may generate sparks or flames. If you smell gas, evacuate the area and call your propane supplier and/or emergency responders immediately.